I have always had a love of reading. I still remember turning my light back on after bedtime as a child and digging into my treasury books full of magical stories until my eyes were too tired to read another page. My love of reading has carried on throughout my teens and adulthood although being a parent does get in the way of me picking up a book sometimes. Once I do start I can never put the book down and tend to finish them in mere days. My problem is finding the time to sit down and think 'right I will start reading that book now'. I am sure I am not the only person who feels like this. Quick Reads are a range of short stories that allow you to indulge in a good book no matter how busy you are. Founded in 2006 they were launched to help adults who have difficulty reading as well as adults who wouldn't ordinarily read for pleasure, therefore making books accessible to everyone. Quick Reads are perfect for people with busy lifestyles and can easily reignite the love of reading to adults who haven't picked up a book in years. Each year, new books written by renowned authors, are released. This February saw the release of six new titles. This years participating authors are Roddy Doyle, Jojo Moyes, Sophie Hannah, Fanny Blake, Adele Geras and James Bowen. Between them their Quick Reads titles cover a range of different themes from a holiday romance to a true story based on a homeless man and his cat. I was sent a few of these Quick Read books by their main sponsor Galaxy to give my opinions on them. After Chloe and her daughter Freya are rescued from disaster by a man who seems too good to be true, Chloe decides she must find him again to thank him. But instead of meeting her knight in shining armour, she comes across a woman called Nadine Caspian who warns her to stay well away from him. The man is dangerous, Nadine claims, and a compulsive liar. Alarmed, Chloe asks her what she means, but Nadine will say no more. Chloe knows that the sensible choice would be to walk away – after all, she doesn’t know anything about this man. But she is curious. What could Nadine have meant? And can Chloe find out the truth without putting herself and her daughter in danger? 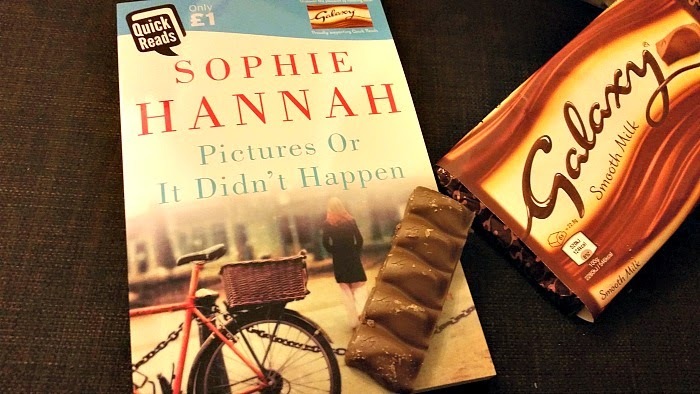 'Pictures or it didn't happen' by Sophie Hannah was the first book I sat down to read. I loved the beginning and I really enjoyed the writing style. I didn't really 'get' the rest of the story though. I did feel like I couldn't put it down and needed to see how it ended put was slightly disappointed by the end of the story that there wasn't a more exciting ending. It hasn't put me off buying any of Sophie Hannah's other books though as I would like to see how one of her longer stories would be and I really did enjoy a bit of me time to sit and indulge in a book. Maggie is married with two grown-up children. Her twenty-five year old marriage to Phil has lost is sparkle. Carla is widowed. She understands life is short so she lives it to the full. But is her new romance all that it seems? When the two women meet in the beauty salon, they soon find they have more in common than the colour of their nails… The discovery that they are sharing the same man is shocking. How will he be taught a lesson or two he won’t forget? 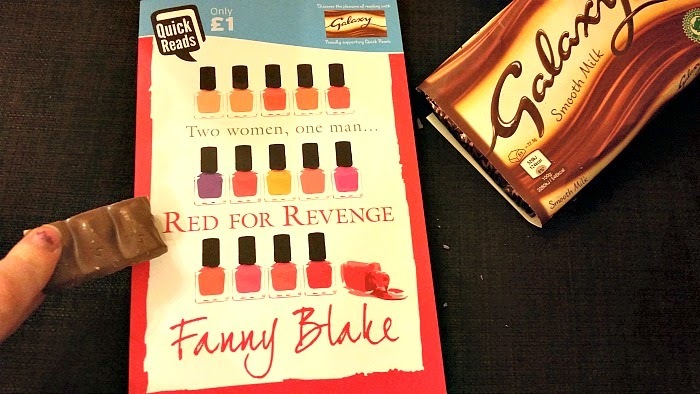 I really enjoyed reading 'Red For Revenge' by Fanny Blake. 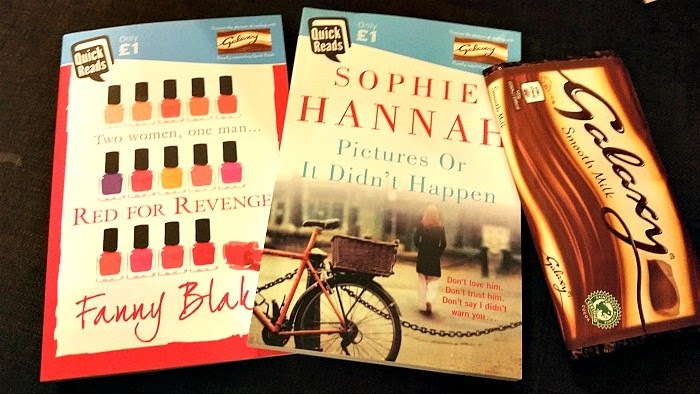 It is your typical girly read but really is lots of fun. I loved the way you instantly feel sorry for Maggie and want better for her. I also like how you quickly warm to Carla and find yourself hooked reading their revenge plots! I won't ruin it but there are some hilarious plots against Phil, who had repeatedly lied and cheated so totally deserves what he gets. Very well written with lovable characters. This book is definitely a must-read. 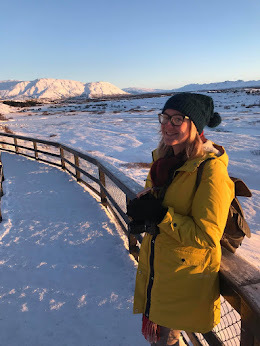 It was really nice to sit down and relax with a book and it made me realise I really do need to do it much more often. It was even nicer to get to do it with a nice bar of Galaxy ;) I will definitely be downloading a few of the Quick Read books to my iPad especially for our upcoming holiday. I was sent the items featured free of charge for the purpose of this review. All opinions are my own. I'd not really thought of short stories as quick reads to fit in. I usually prefer a full novel, but sometimes a short story attracts your attention. I love to read but have trouble finding time to do it now. I haven't been able to finish a novel for years! These sound like a nice way to get back into the habit of opening a good book.